Living Area 6,018 Sq. 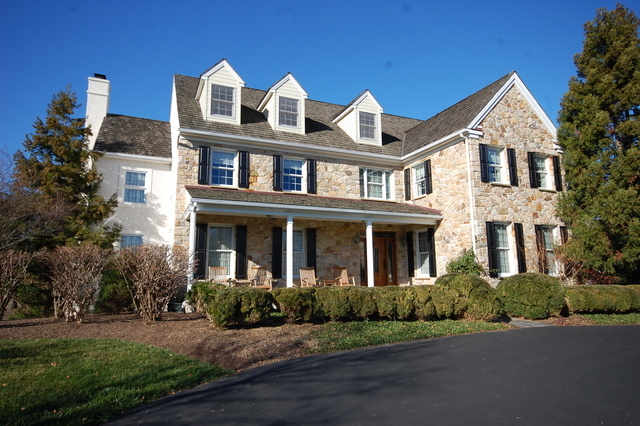 ft.
Gorgeous stone & stucco Colonial in the much sought after Preserve section of Weatherfield sits on 5.53 beautiful acres. This 4 BR, 5 full, 2 half BA home must be seen to be appreciated. Enter the property through the long meandering drive & walk up onto the slate covered front porch. The soaring two-story Foyer w/ the Formal Living & Dining Rooms on either side. In the front of the home, tucked away for privacy, is the Library. The main focus & the heart of the home is Kitchen/Breakfast Room & Family Room. Plenty of space to entertain family & friends. In the rear of the home is the Sunroom looking out onto the sprawling backyard. Take either the front or rear staircases to the second level w/ the Master Bedroom Suite with Sitting Area, His & Her Baths, Excercise/Office Area & Craft Rm. Two of the secondary Bedrooms have en-suite baths & the third Bedroom accesses the Hall Bath. The beautiful backyard has a slate patio & covered porch leading to the in-ground pool with stone retaining walls for privacy.